Authentic Spanish produce, Maestranza brand products use traditional recipes to bring out the true flavour of Spain. 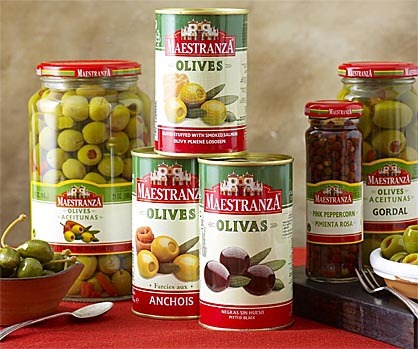 Maestranza products include whole, pitted and stuffed olives, capers, banderillas and lupins. Maestranza is a brand of Sadrym, a company founded in Seville (the artistic, cultural, and financial capital of the southern part of Spain) - click here to visit Sadrym. Sadrym has employed advanced technology to process quality olives and pickle products. Sadrym's innovative processes allows authentic style Maestranza products to be produced and distributed worldwide. 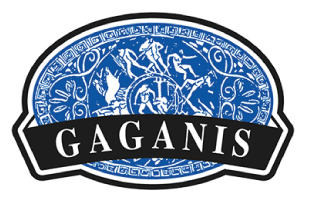 Gaganis Bros is the exclusive importer and distributor of Meastranza products in Australia. Stuffed Manzanilla Olives - with almond, anchovy, salmon, cherry pepper. Round black "meaty" table olives are great for serving as part of an authentic Spanish antipasto. These round black "meaty" table olives are pitted to be conveniently used in salads, for stuffing and in any antipasto selection. Fantastic on pizzas or any meal requiring slices of olives. The flavour is mild and attractive. 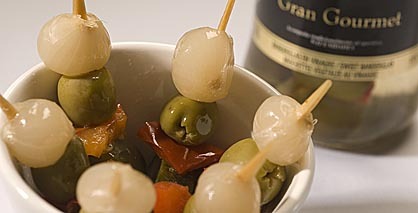 Authentic flavour of Spain with green manzanilla olives stuffed with almond, anchovy, salmon and pimiento (cherry pepper). These round green olives are a jewel from Southern Spain with a full fleshy body and texture. They are great in salads and as a complement to any antipasto platter. 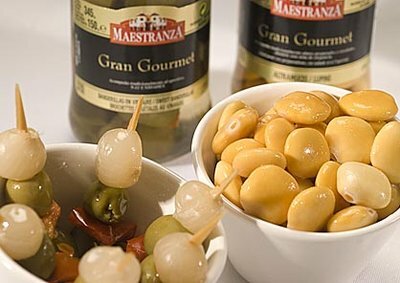 These olives are larger than the manzanilla and provide a fuller flavour. Stuffed with cherry pepper they are a delight to all taste buds and present well on an antipasto platter. These magic yellow seeds are over 4000 years old and have been a traditional part of the European diet. Due to their high protein content they are great for vegetarians. Lupins are legumes, like soya beans, lentils or peas and have been typically eaten like olives in brine. Try them with a glass of red wine or beer, by removing the skin and "popping" the seed directly into your mouth. They can also be eaten with the skin on depending on your preference. The caper is a pickled flower bud of a European spiny Mediterranean shrub plant with distinctive pale lilac flowers and fruits with reddish pulp. These little pickled buds are pungent in flavour and give a distinct character to dishes. They add personality and intensity to fish sauces and condiments and are also great as a garnish for meat and vegetable dishes. Capers straight out of the jar can be a little too salty, so professional chefs recommend placing them in a small strainer and rinsing them under running water before adding them to sauces or meats. Because the flavour can be so intense, most recipes only require a few capers to add sharpness to a savoury dish or sauce. Capers have been a part of Mediterranean cuisine for thousands of years. In fact, capers were often used as informal currency among merchants travelling ancient trade routes. Not to be confused with capers, these berries are larger in size, semi green fruits, milder in taste than the caper and resemble an olive or a large table grape. They are more likely to be eaten as a snack or added to savory salads or dressings. Sliced caperberries can be used in recipes calling for capers if you want a dish that is a bit less acidic. Caperberries are prepared in vinegar brine and may be eaten very much in the same manner as olives or pickles. They could also be an interesting substitution for olives in dishes like pasta or Greek salad. These little peppers are green in color with the characteristic aroma and pungent flavour of fresh green pepper. They go very well with meat dishes, stir fries and also try them ground in salads, steamed vegetables, salsas and sauces. These little pink berries have a pungent, delicate, fragrant, spicy flavour without the hotness of pepper. Great to use in fruit sauces, vinaigrettes, and desserts. Their rich rose colour adds an elegant appearance to any cuisine. These little gems get their name from the barbed darts used in a Spanish bullfight. These miniature darts include olives, gherkin, capsicum and onion. A great tapas, ready to eat, serve with a chilled glass of Rose. Banderillas are an exciting start to any cocktail or dinner event.